Hey there, Legends fans! Come on in, make yourselves at home. Let’s chat. Actually, hold on a second. Before we get down to the more pressing matters here, I want to just take a second to say... Holy crap, right? I mean, we all knew what we were getting into with our Legends after last season, so maybe it’s my own fault for not preparing myself well enough for this premiere, but there was A LOT going on tonight—nuclear (wait, I mean “atomic”) bombs, Nazi spies, kidnapping Einstein…a T-Rex?! And that’s not even touching on the fact that Eobard Thawne and Damien Darhk are BFFs now. Talk about kicking off the Legion of Doom in a (reverse) flash. Terrible jokes aside, it’s a lot of information to process. There’s a bunch of characters on the board and even more moving pieces driving the plot. So with that in mind, my plan is to take it bit by bit; break it down one piece at a time. 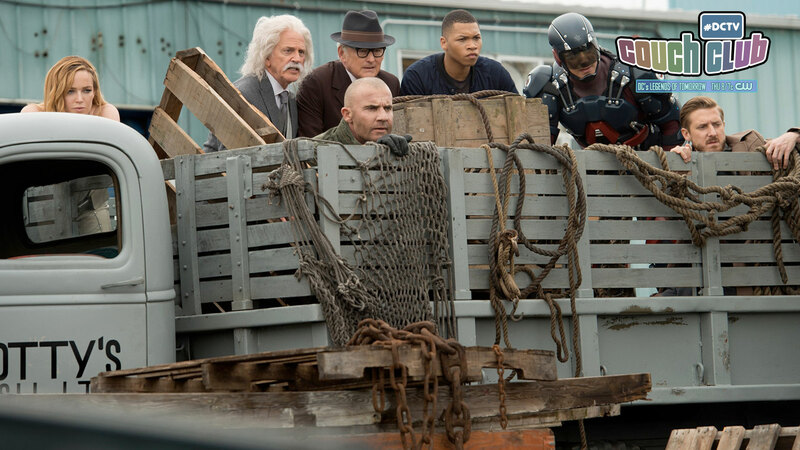 DC’s Legends of Tomorrow is a show that pulls from, and remixes, some of the richest (and, admittedly, most confusing) corners of DC’s history and continuity. My goal with many of these articles is going to be trying to provide some added context—everything from character backstory to potential story points. Think of this as your Legends of Tomorrow extra credit bonus stage, where I’m going to do my best to clue you in on a bunch of of #DCTV Secrets, bits and bats of comics history, and, of course, a dash of good old-fashioned wild speculation. So without further ado, let’s talk about the Waverider’s newest crewmember, Dr. Nate Heywood. Comic fans and Easter egg hungry viewers may have felt their radar pinged by his name, and for good reason. In the comics, the Heywood family is a legacy superhero line dating back to the 1940s with Nate himself being the youngest and most recent. Way back during WW2, comics-verse Nate’s grandfather was a surgically augmented hero and military man named Henry Heywood, aka Commander Steel. Later, comics-verse Nate’s cousin, Hank Heywood III, underwent a similar surgical process to become a hero who called himself Steel (not to be confused with John Henry Irons who also goes by the superhero name ‘Steel’ and is part of the Superman family. There’s no relation.) Several years later, comics-verse Nate was the victim of an accident that granted him superhuman invulnerability and strength. He joined the Justice Society of America under the moniker Citizen Steel. That’s the quick and dirty of it, at the very least. If you’re really eager to learn as much as you possibly can about Nate Heywood’s comic book doppelgänger, you can find him in Geoff Johns’ 2007 JSA run—Nate’s origin and story is told across the very first arc, over the first six issues. Now, if you’ve been paying attention to your Legends news (or, you know, if you watched to the very end of this week’s episode and I hope you did since you’re reading this! ), you’ll know that the JSA is about to storm onto the #DCTV universe in a big way. So, you can see why some understanding of Nate’s origins might be on the brink of becoming pretty important. ...I mean, in theory, that is. As of right now, it doesn’t seem like this Nate and comics-verse Nate have very much in common at all—comics-verse Nate was a former football star, not a doctor or a scientist—but in a show about hop scotching through time and alternate realities, you can never be too sure. We know for certain that Nate’s grandfather, Henry, is a member of this incarnation of the JSA (Matthew MacCaull, a name you may recognize from iZombie, is playing him), and he’s using the alias Commander Steel, but his power set and origin still remains to be seen. We could very well be looking at a totally remixed story for both Heywoods, the same way we’ve seen remixes on the comic book origins for characters like Caitlin Snow/Killer Frost and Wally West/Kid Flash over on the Flash. Which, if I’m being totally honest, is something I would really welcome for Nate specifically. Comics-verse Nate is great, don’t get me wrong, but his origin story is kind of a downer. Not to mention the fact that his power set (the metal infection in his body made him totally numb, extremely heavy, and unable to control his strength) would be a pretty unwelcome complication for the Waverider’s adventures. But then again, “unwelcome complication” is pretty much the Waverider’s middle name at this point. I mean, if time-traveling space ships had middle names. So, who knows? Either way, I don’t know about you guys, but I plan on keeping my eyes peeled for even the tiniest hint about Nate’s future—super powered or not. There’s so much potential here to be played with, and with Commander Steel about to enter the ring, the possibilities are almost endless. We’re exactly one episode into this season and I’m already being kept on my toes which, as a big comics fan (and obsessive speculator), is maybe my favorite part of watching any #DCTV show. Also...speaking of hopscotching through time and being kept guessing, what just happened to Rip? Call me an eternal optimist, but there’s just no way he’s actually gone for good, right?